In CAD/CAM (Computer Aided Design/Computer Aided Manufacturing), products are designed with the help of computers. 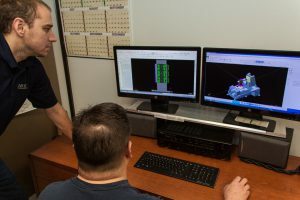 It is a generic term used for a number of technologies, such as computer modeling and design software, rapid prototyping, and computer numerical control. BDE Inc. can provide you with quality CAD/CAM programming services. CAD and CAM Programming Services Provided by BDE Inc.
1. Update on Program Status: Once you retain services from BDE Inc., it is our responsibility to keep you updated on the program status. To help you get the job done efficiently and as you expect, our professionals will work with your engineers. With our service, you can see live status of your job on your computer screen. 2. Comprehensive Design Service: Contracting services from us entitles you to get a comprehensive design service for tool and fixture. We provide our clients with designs as solid CAD model and blueprint. In addition to this, we can also program and supply fixtures, along with proper documentation. 3. Detailed Run Books: We can provide you with detailed run books in both, digital or printable formats. The run books consist of everything from holder list, supplemental operator inspection drawings, and tool lists, to planning maps, set-up images before and after every sequence, and supplemental operator inspection drawings. 4. Contacts with Tool Manufacturers: We have contacts with a number of well-known and reliable tool manufacturers. This allows us to use the tools to your specifications. In initial project phases, we utilize cutting-edge technologies and methods like mock-ups, CAD drawings, and 3-D solid modeling. During different stages of project development, we utilize computer aided manufacturing, production, materials selection, and applications. Adopting specialized processes for the different stages of production allows us to extend our expertise to our clients to help them build products that improve overall employee as well as process efficiency. Aimed at optimizing processes and different business functions, our services are preferred across several industries and geographies. BDE Manufacturing Technologies was honored from Modern Machine Shop to be featured in an article regarding Top Shops 2011: Bob’s Design Engineering, Inc.
At BDE Inc., we have a team of experts who have a lifetime of experience in providing the CAD and CAM programming services. Having served a vast span of industries, such as semiconductors, marine, food, aerospace, military, and medical, we have an immense knowledge of our services. Are you interested? Please give us a call at the earliest. You can get in touch with our professionals on our toll-free number 866.262.6233. Else, you mail us your requirements at info@bdeinc.com. Equipment 10 Seats of Mastercam 2017 CAM Software. 2 Seats of Autodesk Inventor 2016 Design Software. Cutting Edge Server and Networking Technologies. Intel based Multi-core Work Stations.